Not just special occasions but any day of the week! Every year for my birthday, our anniversary, holidays, and often just for no reason whatsoever me husband sends me flowers and I love them. The bright colors, the fresh smell, and the way the florist put so many different kinds together to make something beautiful. No matter what I do my arrangements never seem to turn out that good. Lately though someone has been slacking in the flower department. Valentines Day came and went without a single flower…. I know that I said we didn’t have to do anything for it but it’s always nice to have a beautiful arrangement waiting for you at your desk when you come back from lunch. And it doesn’t have to be a special occasion to send flowers either! I’m open to getting them any day of the week (HINT). With spring upon us all the pretty flowers are in bloom; daffodils, tulips, crocus, and my favorite hyacinths! Any of these would look beautiful on my table for Easter, Mother’s Day, or Wednesday. 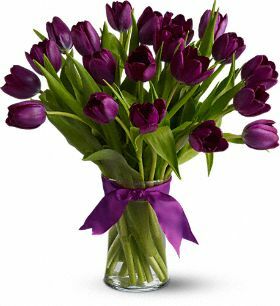 These tulips would be perfect! Why? Because they’re purple of course! One of my favorite colors. Another favorite… lavender. I love the scent of it and how clean and long lasting it is.That is what makes this arrangement perfect! Aside from the gorgeous color it also has lavender in it. 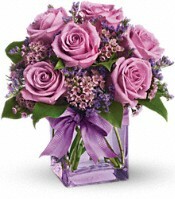 Can you imagine the fresh scent of roses and lavender filling the room and bringing a bit of spring into your house? What could be better aside from a perfectly cleaned house done by someone other than you? My hope is that my husband will actually read this post and send me flowers one of these days for no reason other than he loves and thinks I’m the best thing in the world since sliced bread (is that going a bit far?). What is your favorite flower? Do you get flowers for no reason whatsoever? This sponsored post was made possible by Mom Spark Media. I was compensated for my time investment and work on this campaign. Thoughts are all my own.